Fort Mercer was part of a series of defenses created to keep the British from sailing up the Delaware River to reach the national capital at Philadelphia. These defenses included two other forts in the area, Fort Billingsport about ten miles downriver from here on the New Jersey side, and Fort Mifflin on the other side of the Delaware River. In addition to these forts, a system of obstructions called cheaveaux de frise were placed in the Delaware River. These were large boxes with long wooden spikes stuck out of them, to impale any British ships which might try to sail up the Delaware River. One row of these, known as the lower cheaveaux de frise, stretched from Fort Billingsport to a group of American ships on the other side of the river. If the British attempted to remove the cheaveaux de frise, it would require a great deal of time and effort using two ships. 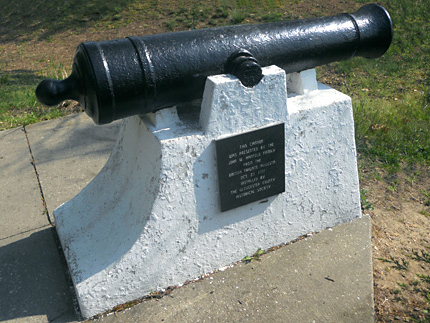 Having Fort Mercer on the shore alongside meant that in the time it would take the British to attempt to remove the cheaveaux de frise, cannon fire from Fort Mercer could sink their ships. The British learned of these defenses and, realizing that they could not sail their ships up the Delaware River, decided to invade Philadelphia by a different route. They sailed up the Chesapeake to a point where they could disembark and then march fifty miles over land to Philadelphia. Although this route was longer and required the lengthy march, it avoided the cheaveaux de frise and allowed the British to take Philadelphia on September 26, 1777. British General William Howe quickly took action against the American forts on the Delaware River. Just two days after the British occupied Philadelphia, Howe sent troops to attack Fort Billingsport, and the American troops there evacuated that fort. On October 22, British General William Howe sent 1207 Hessians under the Colonel Von Donop from Philadelphia to attack Fort Mercer. (Hessians were German mercenary soldiers hired by the British to fight in the Revolutionary War.) The Hessians crossed the Delaware River from Philadelphia into New Jersey, landing in Cooper's Ferry (now Camden). They marched to Haddonfield, where they camped for the night. The following morning, they marched southwest towards Fort Mercer. In order to reach Fort Mercer, the Hessians needed to get across the Big Timber Creek at some point. They marched to a bridge in what is now Brooklawn, but discovered that the bridge there had been dismantled by American forces. This caused the Hessians to march an additional eight to ten miles and cross the Big Timber Creek at the Clement's Road Bridge. From there, they marched to Fort Mercer along a path of what is now Almonesson Road, Caufield Road, Deptford Avenue and Hessian Avenue. The Hessians made their attack on Fort Mercer around 4 p.m. in what became known as the Battle of Red Bank. The 1207 Hessian troops greatly outnumbered the 614 American soldiers within Fort Mercer, who were under the command of Colonel Christopher Greene. However, Green had received advance warning about the attack. The battle lasted only forty minutes. Despite their superior numbers, the Hessians were decisively defeated, suffering over 514 casualties. The Americans suffered only 14 killed and 23 wounded out of 600. Among the Hessian casualties was their commanding officer Colonel Von Donop. Donop was treated for his wounds in the house of James and Ann Whitall, where he would soon die. 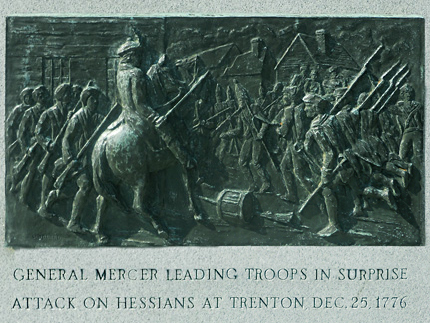 The defeated Hessians made their retreat to Haddonfield, where they again camped for the night. The following morning they marched back to Cooper's Ferry, from where they crossed the Delaware River back into Philadelphia. 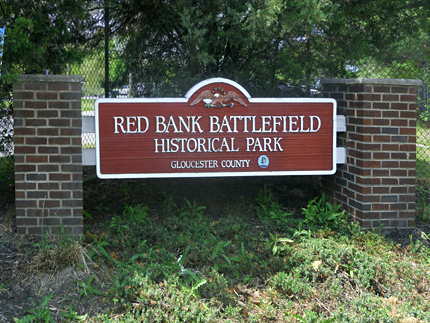 Red Bank Historic Park is a great place to visit. In addition to its historical significance, it is a nice park in itself, with walking paths and a great view of the river. The history of the area is told in plaques and monuments throughout the park and in the James and Ann Whitall House, which serves as the park's museum. Details about several of the individual features of the historic park appear in the entries below. The James and Ann Whitall house was built in 1748 on their 400-acre property. Fort Mercer was constructed just north of the house in 1777. Among the wounded Hessians treated here was their commanding officer, Colonel Carl Von Donop, who died in the house. He was one of hundreds of Hessian soldiers who were buried in the area north of the house. 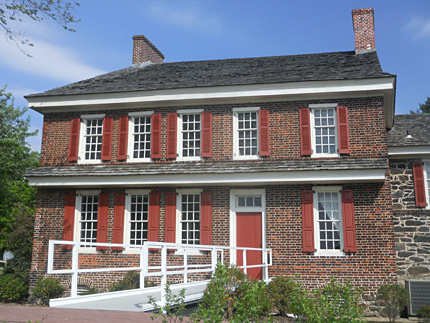 The house is now used as a museum, with Information and exhibits which describe and interpret the lives of the Whitalls and the Battle of Red Bank. Of particular note is an exhibit which is a scale model of Fort Mercer. 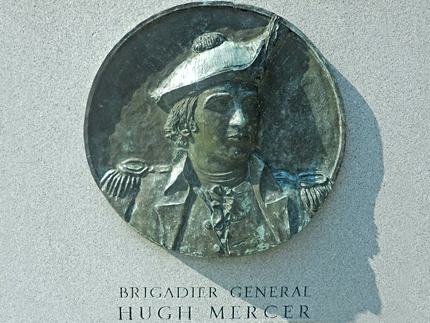 Fort Mercer was named for Brigadier General Hugh Mercer, who had died from wounds suffered at the Battle of Princeton in January, 1777, several months before construction on the fort began. 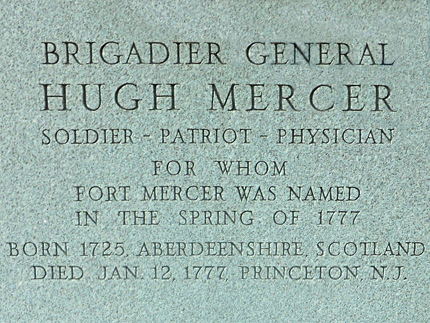 Mercer was born in Scotland in 1725. 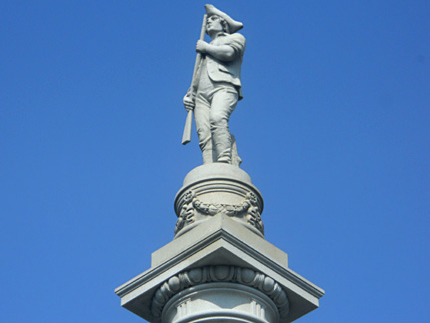 He immigrated to Pennsylvania in 1747 and moved to Virginia in 1760. Mercer County is named for him. 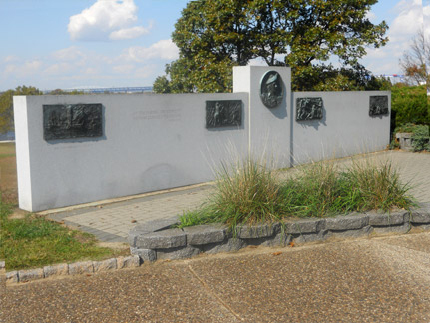 This wall is located in the section of the park where Fort Mercer was, overlooking the Delaware River. 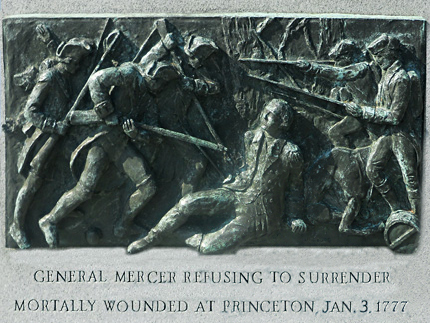 The wall contains five bas relief sculptures, including a portrait of Hugh Mercer and depictions of him at the Battles of Trenton and Princeton. Born in Poland in 1746, Thaddeus Kościuszko was an officer and talented military engineer who came to America in 1776 to fight on the American side in the Revolutionary War. 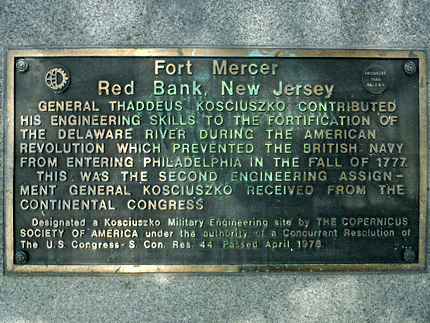 Kościuszko's first assignments in America were in New Jersey, beginning with the fortifications at Fort Billingsport several miles west of here on the Delaware River. 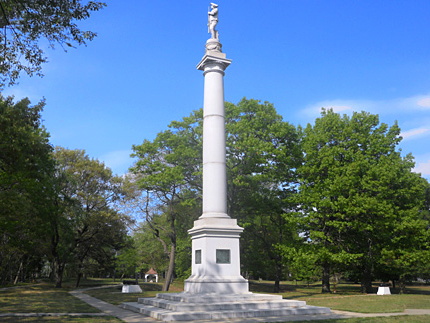 There is a bust sculpture of Kosciuszko located about ten miles from here; it is part of the Polish American Congress Monument in Pennsauken. Note that the numbers of Hessian troops and wounded vary slightly from source to source. For this entry, I have used the numbers which appear in exhibits inside the James and Ann Whitall House. 3. ^ Plaque states "Designated a Kościusko Military Engineering site by the Copernicus Society of America under the authority of a Concurrent Resolution of The U.S. Congress - S. Con. Res 44, Passed April 1978."